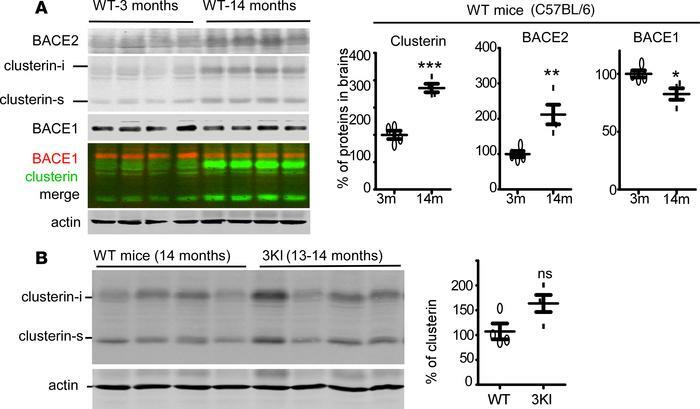 Altered expression of clusterin, BACE1, and BACE2 in aged brains. (A) Brains from C57BL/6 mice at the age of 3 months and 14 months were homogenized in RIPA buffer and the brain lysates were Western blotted for clusterin, BACE1, and BACE2. Protein bands were quantified and plotted. For the quantification of clusterin, the intracellular form (clusterin-i) and the secreted form (clusterin-s) were combined. (B) Brain lysates of C57BL/6 mice at the age of 14 months and 13- to 14-month-old 3KI (APPSwedish-Arctic-Iberian/Swedish-Arctic-Iberian) were blotted for clusterin. Both forms of clusterin were quantified and combined for plotting. *P < 0.05; **P < 0.01; ***P < 0.001 (paired t tests). ns, non-significant. All bars represent mean ± SEM.